*New rate just added! Our new online-only newsletter subscription is being offered at the special rate of just $209. Offer applies to new subscribers only. 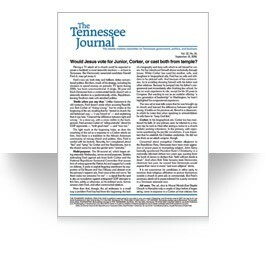 The Tennessee Journal tracks key Tennessee political developments at the federal, state, and local levels. Where specific legislation originates and why. Who wins and loses if it does. The Tennessee Journal delves into complicated issues such as workers' compensation and business taxes that mainstream news publications often ignore. No one handicaps state elections like The Tennessee Journal, which offers comprehensive reports in weekly editions and district-by-district breakdowns in supplemental charts. Each Friday, Journal subscribers receive critical intelligence and analysis in sharply written, unbiased accounts sprinkled with humor. The Journal is delivered by email in a PDF format and can also be downloaded from our website. A print version is mailed the same day at no extra charge. Download a sample issue today! Before joining the Tennessee Journal, Erik Schelzig had worked for The Associated Press since 2003. He covered sports, courts, and business in Florida and West Virginia before becoming the AP’s Capitol reporter in Tennessee in 2005. He has been listed by The Washington Post as one of the top statehouse reporters in the country. He holds a master’s degree in political science from George Washington University. Tom Humphrey, retired Nashville bureau chief for The Knoxville News-Sentinel, is a contributing editor for The Tennessee Journal. Humphrey, who continues to edit a popular political blog and write a weekly column for the News-Sentinel, has covered the legislature since 1980, originally for United Press International. He is a graduate of the Nashville School of Law. Jackson Baker, contributing editor for The Tennessee Journal, has covered the Tennessee political scene for decades. He is a senior editor of the Memphis Flyer.